A Workshop and Critique night for the June meeting – just the thing for the first meeting in winter, with a good number of members present. 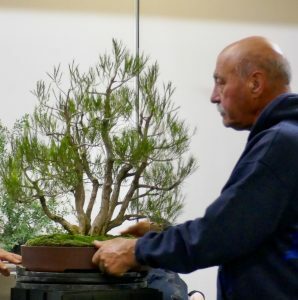 With only a couple of trees on the display table, but plenty of trees being worked on, it was quickly down to business this month. 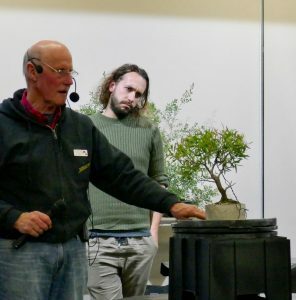 The display table trees were a Kunzea phylicoides, Burgan, which came from wild stock and which had been developed in workshop sessions with Hugh Grant last month, and a Leptospermum brachyandrum, Silver Weeping Tea Tree. A couple of Marg’s pots were held up for discussion first, along with several of the pots made by members under Marg’s tuition at the recent Saturday workshop. 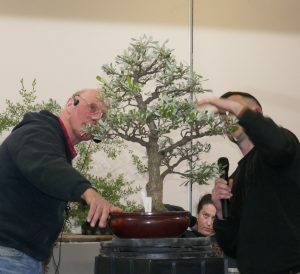 Plenty of discussion as to the best tree possibilities for the two pots reviewed, and this session, as always, generated quite a few interesting ideas in relation to size, shape, depth, colour and finish of the pots. 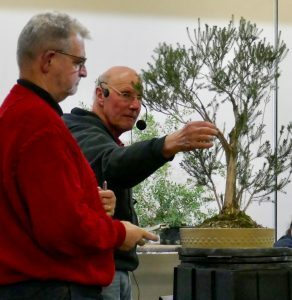 The Show and Tell / Critique session followed, with a number of plants brought up for discussion, ideas and input for their future development. 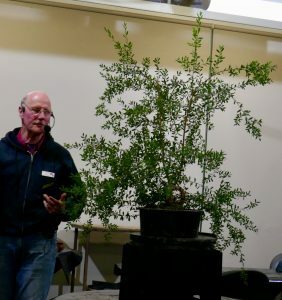 First up was a Leptospermum laevigatum, which had its trunk heavily wired and bent quite drastically, as an experiment to see how the trunk would develop as the wire became incorporated into the trunk as it thickened up over time. Second tree was Leptospermum petersonii, always a good tree to develop as a bonsai. 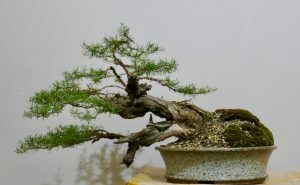 This tree has been 7 months in training, but has great promise, with its excellent bark, good responsiveness to pinching and pruning, and will be most interesting small tree with a compact crown. 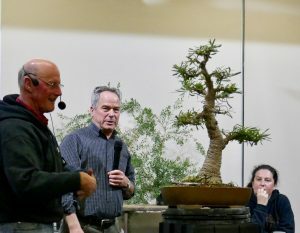 The third tree for review was a Banksia marginata, with a broad agreement as to needing a reduction in height to get better overall balance as it develops. The tree came back later in the night with much of the leading trunk and crown removed. A much older Banksia serrata was then brought up for discussion, having previously been cut back from being a much taller tree. This tree generated plenty of discussion as to branch distribution, tree height, and leaf development. A couple of groups of trees were brought up, the first being Melaleuca sp (Mel. armillaris? ), which were seedlings from 2014, and showed considerable development since then. 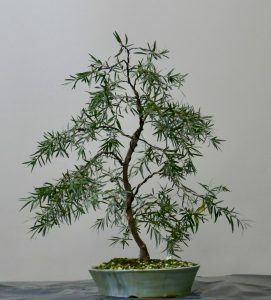 A few ideas as to the best pot, and a couple of thoughts about branch placements, but this was a great group planting showing considerable potential. 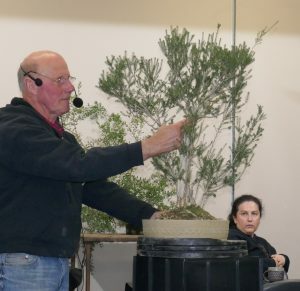 Another tree reviewed was a Melaleuca ericifolia, which has been allowed to develop with a number of new shoots arising from the roots around the base of the tree. This has been worked on using a “break and tear” approach to branch removal, to help develop a much more informal and natural wild feeling to this tree. 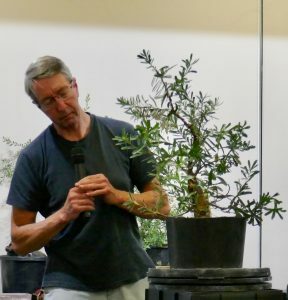 A Banksia integrifolia was an older tree which came from another grower’s collection, and which would be expected to benefit from repotting and significant work on its branch structure and foliage pads.